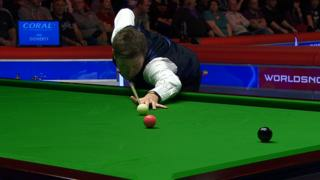 Ricky Walden makes back-to-back century breaks to win his third round match against Ken Doherty at the UK Snooker Championship in York. Leading 4-1 in the fifth frame, Walden showed great composure to clear the table with a break of 129 before a lightning-fast 128 secured the match. BBC Sport snooker commentator and 1991 world champion John Parrott describes Walden's performance as "top class", saying "you can't do better than not missing".